Steve Henderson, Program Chairman of The Villages Freshwater Fishing Club, has arranged for two celebrated Florida bass fishing pros to be present at the club meeting on December 9, Terry Scroggins and Shaw Grigsby. This is an opportunity to meet and talk to two of the best. Don’t miss it. Terry Scroggins might just win the Mr. Congeniality award if pro bass fishing had such a thing. The central Florida native is upbeat, always optimistic and quick to lend his mechanical mind to fix just about anything he or his fellow pros tear up along their 40,000 miles of travel each year. He can fix a pretty mean ribeye on the grill too. Scroggins is pretty quick to figure out the winning fishing pattern too. 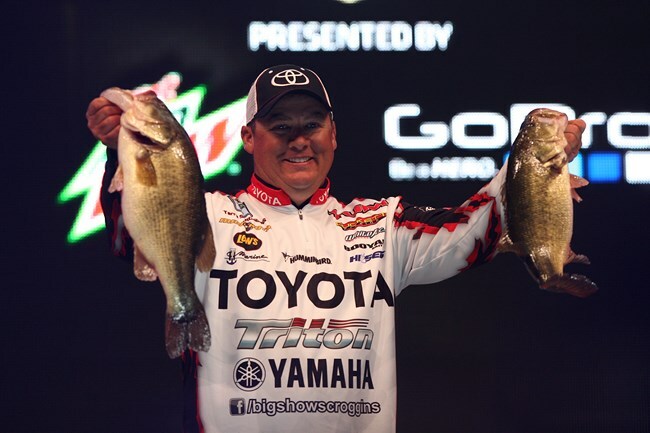 He reached the $1,000,000 in BASS winnings faster than just about anybody in the history of the sport. Once perceived as only being able to win in his home state of Florida where he earned the nickname “Big Show” — Scroggins has proven he can succeed anywhere in America. In early 2008, he missed eclipsing the BASS single-day catch record by just ounces in south Texas.